The name "Chebec" comes for the Arabian and means "runner". All the other spellings mean the same ; they are phonetically transcriptions in various languages (for example the "x" was the old Spanish equivalent of the modern "jota"). Chebecs originated in North Africa, in the late 16th or 17th century they were sloop-sized, light and fast sailing ships designed for privateering. The Spanish built some to hunt Muslim privateers. The Maltese, the Venetians and the French built a few chebecs in the mid 18th century. The Swedes also built a few chebecs and oared frigates in the late 18th century. I guess the Ottomans and their clients also did. The hull was inspired by small galleys, with no outriggers. It was lightly built, with long overhangs fore and aft. Some had a double deck: a curved one low on the water, and a grating one for the crew. They were lightly gunned: typically 14 to 24 x 4 or 6 pdrs, but had a large crew and many swivel guns. Their rigging was designed to outrun any stronger warship in the Mediterranean light winds: 3 masts with large lateen sails and a gib. 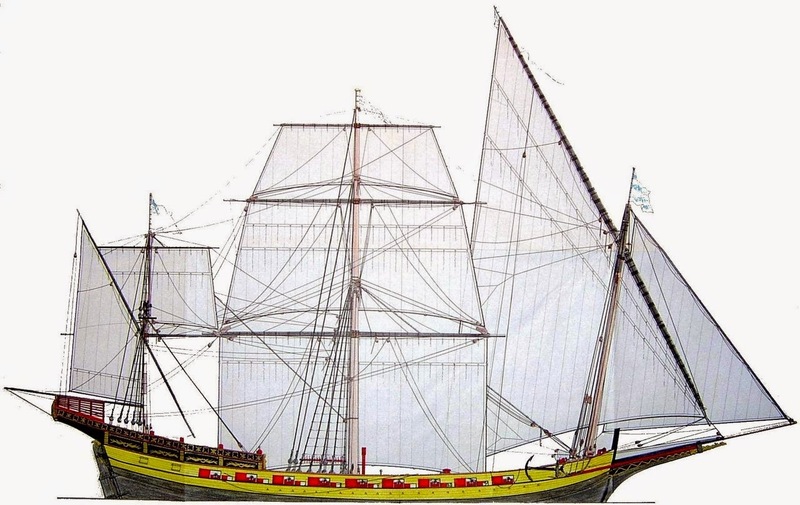 Some European chebecs were rigged as "chebec mistic", with square sails at the main and mizzen masts (like a polacra). Later, some were ship-rigged, looking like sloops except for the hull. Chebecs also had auxiliary oars (this was copied by the Swedes) but were not galleys! All this required a large crew, but this they had. So Chebecs were cheap ships, excellent for privateering in the Mediterranean. However they could not stand a gunfight with a frigate or large sloop, and were much at disadvantage in rough seas. As for Venice, I don't know if they had many chebecs in the early 17th century. Bonaparte captured some in 1797. Likely they preferred galleys and ships. They rather protected their shipping by a line of fortified ports along the trading routes. I have no idea on the Uzcocks ships, but in the early 17th century I guess their ships would be smaller and more conventional than Chebecs. Venice had kinds of "triremes". In the late middle ages most Mediterranean galleys were rigged "alla scalaccio" (in echelon), that is 3 men on the same bench, each with an oar. 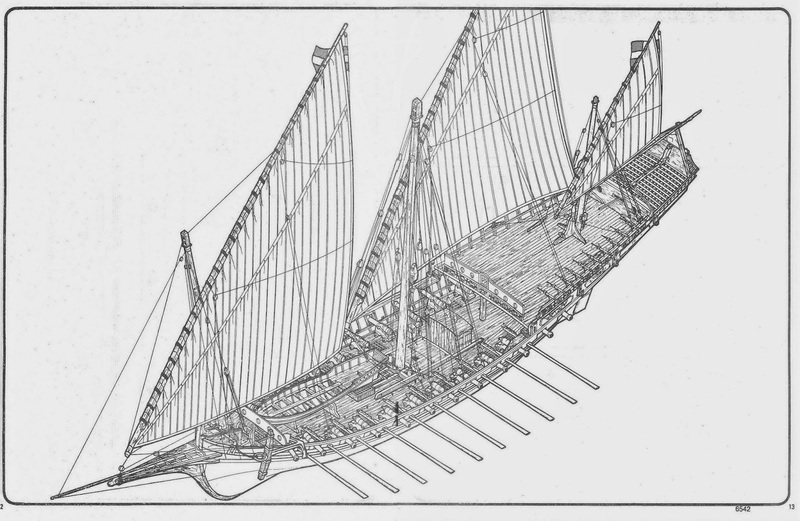 But the oar swivels were all at the same level on the outrigger, unlike in ancient triremes. This optimised men's effort but required good training, and the design could not be enlarged. By the early 16th century states and navies grew and required more men. They used more and more unskilled slaves and prisoners. The Venetians designed a new system "alla senzile”: 3 to 5 men per bench, handling one large oar. Only the lead rower needed to be skilled, the others just followed his move. This allowed larger ships, but the side men were much less effective. Maximum speed dropped from some 6 to 4 Knot (more or less: a much discussed topic), as compared with 9-10 Knots maximum for ancient triremes (cf. Olympia's trials). The "senzile" system was soon adopted by all Mediterranean nations, and older galleys were reequipped that way. By the late middle ages, Mediterranean trading ships were both sailing and oared ships, in fact heavy galleys, with the crew rowing and fighting - and possibly a few soldiers. However they were slower than war galleys. In the early 17th century Venetian merchants were generally sailing ships, but some light, expensive goods and personalities would travel on war galleys for safety and speed. Chebecs were faster than merchant ships and, with some wind, than war galleys. Their design effectively made them predators to merchant shipping.